Security, MacOS, Linux, Python, Malware, Networking, How to and more... Just for educational purposes only. I still can’t connect to a remote URI, why? Run virt-manager with either the –debug or –no-fork option to get password prompt via the CLI. Why can’t I connect to a local URI (e.g., qemu:///system)? Everything was working yesterday, but it’s not working today, can you help? If you don’t do this, you might get an error like open /dev/kvm: Permission denied in the virtual machine logs in the /var/log/libvirt/qemu/ directory. Please note that whenever you modify the VM’s xml file in /etc/libvirt/qemu/, you must run the define command again! To leave the virtual shell..
Internal snapshot: A type of snapshot, where a single QCOW2 file will hold both the ‘saved state’ and the ‘delta’ since that saved point. ‘Internal snapshots’ are very handy because it’s only a single file where all the snapshot info. is captured, and easy to copy/move around the machines. External snapshot: Here, the ‘original qcow2 file’ will be in a ‘read-only’ saved state, and the new qcow2 file(which will be generated once snapshot is created) will be the delta for the changes. So, all the changes will now be written to this delta file. ‘External Snapshots’ are useful for performing backups. Also, external snapshot creates a qcow2 file with the original file as its backing image, and the backing file can be /read/ in parallel with the running qemu. VM State: This will save the guest/domain state to a file. So, if you take a snapshot including VM state, we can then shut off that guest and use the freed up memory for other purposes on the host or for other guests. Internally this calls qemu monitor’s ‘savevm’ command. 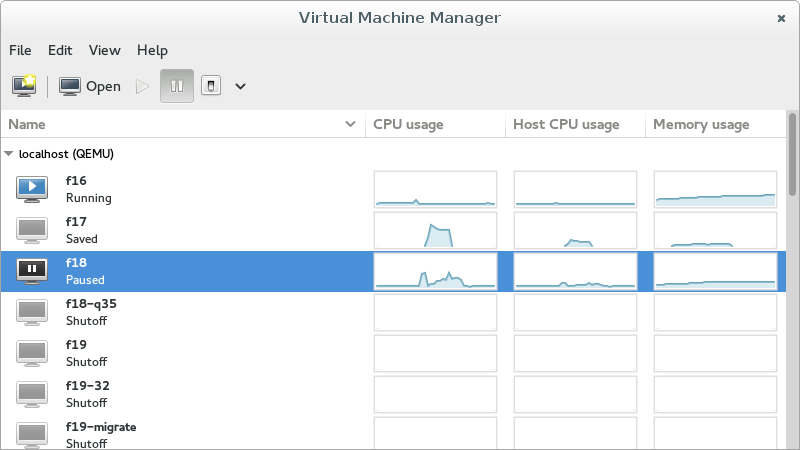 Note that this only takes care of VM state(and not disk snapshot). Before creating a snapshot, we need to create a snapshot xml file with 2 simple elements (name and description) if you need sensible name for the snapshot. Note that only these two fields are user settable. Rest of the info. will be filled by Libvirt. Dump some basic information about the image file. Includes the size on disk of the file, the name of any backing file referenced and a list of the snapshots available. List all the snapshots in the specified imagename file. Create a snapshot and name it snapshot-name. This snapshot is a simple picture of the VM image state at the time the snapshot is created. Apply a snapshot named snapshot-name. This function simply restores the clusters that were saved when the snapshot, snapshot-name, was created. It has the effect of returning the VM image to the state it was in at that time. Delete the snapshot named snapshot-name from the specified image file, imagename. Snapshots can gobble-up a significant amount of disk space. The delete command does not actually release any disk space allocated to the image file but it does release the associated clusters - effectively making them available to the VM for future storage. The convert command, when converting to and from the same QCOW2 format, acts as a copy command that only copies the current state of the VM image to the output file. The -p option displays progress information during the copy operation - which is often quite time consuming. The output file, imagename2, will contain all the clusters of a backing file that were referenced in the original image, imagename1. It will not copy any snapshot information. This has the effect of creating a standalone image with no references to any backing image. The -c option tells qemu-img that we want to create a snapshot of the current VM image state. The snapshot-name is the ID that we want to assign to this state of the VM image. The imagename is the disk file name for the VM image with which we are working. Putting it all together: Open a shell and change to the directory in which you have your image files. In the following example I am working on the same VM image that I created above and now I’m saving the image state using the name base-win7pro-winupdates-ie9. The -a option tells qemu-img that we want to apply a previously created snapshot of the VM image state - ie: we want to apply that snapshot so that it becomes the current image state. The snapshot-name is the ID of the previously created snapshot. This example will convert a raw image file named centos7.img to a qcow2 image file. Shutdown you machine if it is turned on. Click on “Show virtual hardware details“. Click Apply and choose YES to the “You are switching graphics type to spice, would you like to add Spice agent channels?” question. Now, select Video and set the Model to “qxl” and click apply. Turn on your machine and login. Reboot the guest, and voila it works. Instead of using “host”, you can also choose a number of other CPU models from the list displayed with the “qemu-system-i386 -cpu help” command (SandyBridge, Haswell, etc). So replace REPLACEME with your cpu which you selected. $ virsh snapshot-create "<Name of VM>"
VM snapshots can be managed using the following commands. –live creates a dump file on a running machine and doesn’t pause it. –crash stops the guest virtual machine and generates the dump file. The main difference is that the guest virtual machine will not be listed as Stopped, with the reason as Crashed. Note that in virt-manager the status will be listed as Paused. –reset will reset the guest virtual machine following a successful dump. Note, these three switches are mutually exclusive. –bypass-cache uses O_DIRECT to bypass the file system cache. –memory-only the dump file will be saved as an elf file, and will only include domain’s memory and cpu common register value. This option is very useful if the domain uses host devices directly. The DHCP range is between 192.168.122.100 and 192.168.122.254. Please note down the MAC addresses of the xenial VM that you want to assign static IP addresses. ip='192.168.122.4' – VMs static IP. PING 192.168.122.4 (192.168.122.4) 56(84) bytes of data. Each time the guest or VM called xenial comes online (or rebooted for the kernel update) it will get 192.168.122.4 as static IP address by dnsmasq DHCP server. Set up SSH keys between your local and remote system to avoid the prompt. I’ve not yet tested virt-manager against any local URIs/hypervisors. If you get virt-manager working with a local hypervisor and needed to take any special steps, feel free to share the details. If virt-manager or its dependencies have been upgraded recently (brew upgrade), it’s possible that a reinstall may fix the issue (see #39). I saw first time in few year problem with compilation, where before it worked just fine. I had installed all libz related packages and still had problem with this. SOLUTION I dislike this solution but that was uniq way to get it working just fine. I will not tell you what is R2, because if you read it, you know what is it. Is an awesome tool for RE. vala-0.24.0; ./configure --prefix=/usr ; make && sudo make install ; cd ..
git clone git://git.gnome.org/vala && cd vala && sh autogen.sh --prefix=/usr && make && sudo make install; cd ..
cd radare2-bindings/ctypes; make; cd .. Installing valabind, not install it with apt-get, because you will get old version, you can check version of package using apt-cache show valabind, if is < 0.8 download it from official repo. cd radare2; ./sys/all.sh; cd ..